Sacred healing plants from Amazonia - ARTE AMAZONIA provides a global voice through art for the indigenous cultures of the Amazon. Ayahuasca is a medicinal tea prepared from Banisteriopsis Caapi, a jungle vine, found in the tropical regions of South America, often combined with other plants, commonly Chacruna/Rainha (Queen); Psychotria Viridis. This drink is widely employed throughout Amazonian Perú, Ecuador, Colombia, Bolivia, western Brazil, and in portions of the Río Orinoco basin. It has probably been used in the western Amazon for millennia and is rapidly expanding in South America and elsewhere through the growth of organized syncretic religious movements such as Santo Daime, União do Vegetal (UDV), and Barquinia, among others. In traditional rainforest practice, other medicinal or visionary plants are often added to the brew for various purposes, from purely positive healing (blancura) and divination to malevolent black magic (brujeria, magia negra or rojo). The shamanic use of ayahuasca is usually within the context of healing. The shaman or ayahuasquero takes ayahuasca to better diagnose the nature of the patient's illness. The mestizo shamans of the Peruvian Amazon generally refer to themselves as vegetalistas, plant-doctors. They claim they receive their healing skills from certain plant teachers, who are believed to have a madre or spirit-mother. The role of the shaman is to mediate the transmission of medicinal knowledge from the plant teacher to the human world for use in curing. Artist and Peruvian vegetalista Pablo Amaringo has painted a series of his past ayahuasca visions, depicting them in great detail. In order to do this, Amaringo will attempt to recall one of his visions, sometimes by singing the icaro he sang at the time of the vision. This brings back the image so vividly that Amaringo is able to project it onto a canvas and then simply trace it adding colors later. 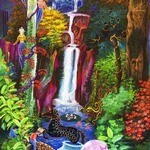 Images from ayahuasca visions are a predominate feature of Amazonian art. It has been suggested that this visual art along with the melodies of the icaros combine with the synaesthetic effects of the potion to produce an "aesthetic frame of mind" central to the healing process. The design the shaman paints onto his or her body is believed to represent a healthy energy pattern, and is often revealed by the ayahuasca. When a person becomes sick, their energy pattern becomes distorted. Under the influence of ayahuasca, the shaman can see the distortion in the patient's energy pattern and attempt to restore a healthy pattern using suction, massage, medicinal plants, hydrotherapy, and restoration of the patient's soul. The similarities between these shamanic methods and techniques used in traditional Chinese chi-gong, or "energy directed" medicine, should be noted. Interestingly, a shaman usually chooses medicinal plants based on visible characteristics, like shape or color. For example, a plant which produces flowers shaped like an ear may be used to treat ear diseases. Part of the novice shaman's training involves scrutinizing nature to learn about the properties or "hidden virtues" within the surrounding plants and animals. 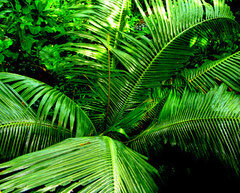 Today, there has been increased interest in the healing powers of Ayuhuasca and Amazonian ancient knowledge. All in all, ayahuasca represents a unique plant-based medicine. The fact that its traditional use by Amazonian Indians has survived the continual influence of Western acculturation is testimony to the central and important role it has in their world-view. In fact, in many Amazonian tribes the first thing the parents will give a newborn baby is a drop of ayahuasca - right in the mouth. To them it is the supreme medicine, and a true gift from the gods.